I am alive, I swear it. For proof I offer photographs of trout lilies taken on a recent walk, which would be difficult to do if I were posting from beyond the grave. Those of you who know me will know how inordinately happy I was to find these, and in profusion too, all over the floor of a local woodlot. To me, the blooming of the first trout lilies is the best and surest sign that spring is really here; plus, they’re pretty. Trout lilies fascinate me. 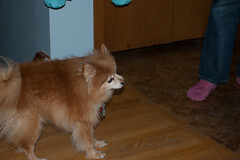 They can propogate either reproductively or through runners. For the first two years, all a new trout lily does is grow a root; in the third year, a single small brown-and-green splotchy leaf will appear aboveground. A couple years after that, it’ll manage to grow two leaves; around year seven or eight, the trout lily will produce its gorgeous yellow flower. 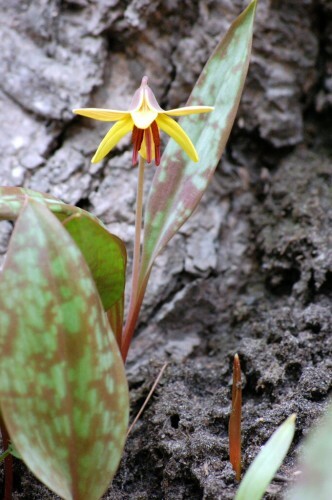 Even in the best sites, only about 35% of trout lilies will be of flowering age at any given time. All of which is to say that while there is nothing illegal about picking trout lilies, it’s not a spectacular idea since it won’t be replaced for at least seven years. Rumour has it that trout lilies have emetic properties and were used by First Nations as a contraceptive. They are also, apparently, edible–but for god’s sake, please don’t. 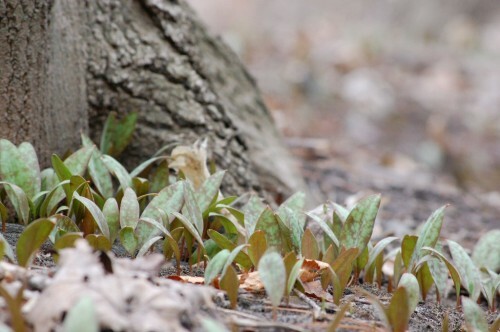 They grow thickest and soonest at the base of substantial tree trunks because the microclimate is a bit warmer, so if you’re hunting for trout lily, look at the base of old trees (or on gentle sun-facing slopes). 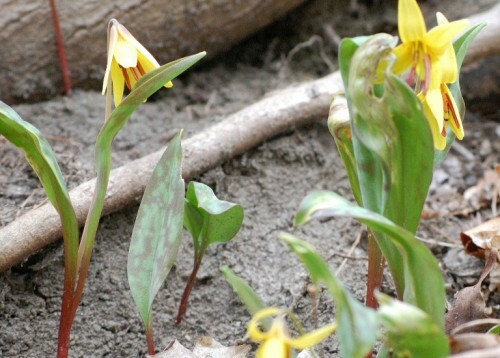 Trout lilies like moist, relatively open hardwood forests with plenty of leaf litter; they’ll bloom in the GTA from about mid-April through part of May (so if you want to see them, get out there in the next two or three weeks). Because they are so fragile–taking so long to grow and having such specific site requirements–they are easily out-competed in more open environments by tougher and more vigorous annual flowers. In the shade of deciduous trees and on ground perpetually carpeted by decomposing leaves, they can grow and flower–but only until the trees bud and leaf, at which point the shade kills them off. They look so fragile and delicate, but it is that very fragility which enables them to thrive in environments where stronger plants can’t grow. I wasn’t able to find any art or folklore related to the trout lily, but if any of you know of some, let me know and I’ll add it. 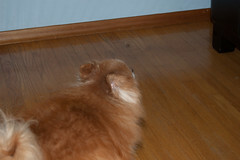 Otherwise, I’ll keep looking. If you’re interested in the biology of Trout Lilies, I recommend reading a fascinating study entitled “14C transfer between the spring ephemeral Erythronium americanum and sugar maple saplings via arbuscular mycorrhizal fungi in natural stands.” The study found that nutrients acquired by early blooming Trout Lilies found there way into nearby Sugar Maples. The nutrients were transferred via soil organisms called mycorrhizae which attach to the roots of both the ephemerals and the forest trees. This gives the maples an extra boost in the spring for their own growth. The study suggested that there might also be a reverse process in the fall but were not able to confirm it. The study was published in the July 2002 edition of Oecologia, vol. 132, no. 2, pp. 181-187. Authors Lerat et al.